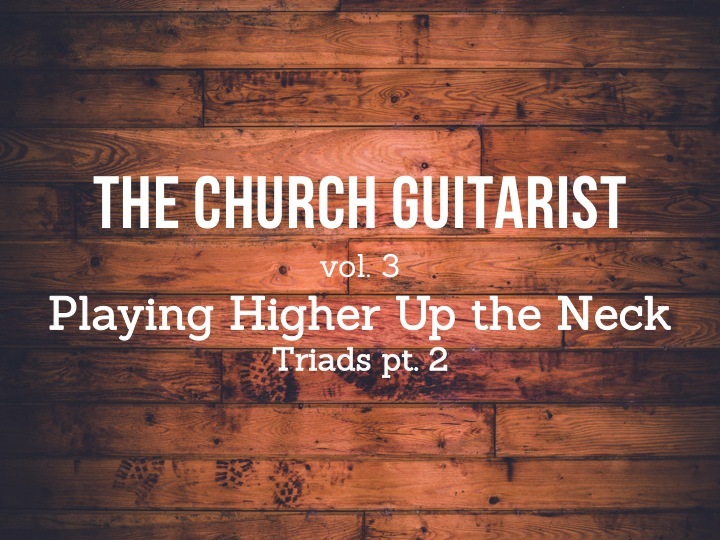 As an electric player, you have the ability to move out of the low parts of the neck, get away from where the other guitars or keys are playing and create a part up high. This can make your arrangements, playing, etc. way more interesting (so that everyone isn't playing in the same zone). With these, you should be able to play any major or minor chord you need to, higher up the neck. In the next post we'll talk about how you can practice this stuff if you're interested in digging more deeply, but for now I wanted to talk about how to use them. This comes from a song called The Funeral by Band of Horses. The chord progression runs through the bulk of the song and uses, mostly, one shape that is just slid around. Wait! Isn't that just plugging in the right chord at the right time? Yes, but it creates an interesting melody line along the way, kind of a hook, and that's important. Keep your ears open and don't think it has to be too complicated to sound good. The song is recorded in the key of A. In the intro, the guitarist plays a slightly tweaked A triad up on the 9th and 10th frets (the one that looks like a D chord; second inversion if you know about that). Feel free to move notes around on these shapes. If it sounds good, go for it even if you don't know what it is. In this case it makes an "A2" shape (more on 2's, 7's, 11's and that stuff later) and the player picks through the notes in a constant pattern. With delay added, a little reverb, this creates a nice wash of sound. In fact, though you could definitely do more, sometimes just finding a high version of the chord for the key the song song is in (i.e. an A chord in the key of A) is a great place to start, will create a nice higher layer of sound, and will give you lots of ideas. 2. Think melodically, even with your chords. Mess with the notes or even the strings you play them on. 4. Don't always just play the block chord. Sometimes picking a few notes and letting it sit is a refreshing change. 5. Also, if you listen to the song and compare the above, you'll notice the guitarist does not overplay while the singer is singing. That's important. Don't get in the way or distract from the main melody. Check out the next four chords. You see some of the same ideas, just varied a bit: sometimes playing the straight chord, sometimes playing a few notes, sometimes nothing. Anyway, take some of these ideas and try to come up your own version over these chords or another song. This is where a "part" comes from: taking a bit of a song you're playing and practicing different ideas over it. Over time you'll find something you really like. Stick with it. Don't think that a good idea always comes immediately. That's why they call it "carving out a part." In the chorus the chords move more quickly. Instead of trying to play every single chord change as they go by, the part is built off the same, basic A triad you saw in the verse (and combines it with the A triad right next to it, making a bigger shape). They pick though (arpeggiate) the chord adding a few extra notes here and there. In the second half they create a little melody, while keeping the same basic A triad shape as a base. This is another great example: don't feel like you have to play every chord change. Sometimes a simplified part, even just one chord, will sound good over multiple chord changes. Try it out. Play guitar with your ears, not just your fingers. We could go on and on. There really are unending examples, but this is a good place to start (I'll post more as I get to them). Keep listening. Keep working on this stuff and the creativity will come. Let me know if you have any questions. In the meantime, practice up and thanks for serving your local church! Alright electric players*, this is a good place to start, especially if you're looking to break out of first position and move up the neck. Be sure to check out the acoustic posts on CAGED families as a lot of that will apply to you as well but I wanted to start with something that would be pretty immediately useful (though you can go really deep with this too): chord triads. Fancy name for very useful little chord voicings. You may go to some of these already. In fact, if you play any chords at all you already do play them, either way, you're hearing these particular voicings of chords ALL the time. We'll look at examples in songs soon but for the next couple of posts we'll talk about what they are, how to use them, and how practice them. Consider the example to the right (Figure 1), Triads in C major (if the term triads freaks you out, just think "little chords"). If you're not familiar with these they might look a little strange but the example shows you two things: First, there are three shapes, and second, they move up the neck. So, for one C chord, you have 3 choices that move from the bottom of the neck all the way up to the twelfth fret (even more if you keep repeating the shapes). That's a lot of distance and will help you not be stuck on only one zone of the neck.. Again, as I've mentioned before this stuff is like building your musical vocabulary. You want to have options and be able to be as creative as possible. These will help you loads and is absolutely essential for an electric player (really any guitarist). The diagram is a representation of the guitar neck starting at the first fret (top of the pic) moving all the way to the 12th fret. Certain frets are numbered for guidance. The chords are also labeled with R, 3 and 5 for root, third, and fifth. The black dots are for your fingers and the open circle is the root. Finger them however it makes sense. OK, so check the chords. Play each one. Don't just strum through them but play the notes one by one. Try playing the notes in different orders. Move them around. Chances are it will start sounding like something you've heard before. You might even start getting a creative idea. 1. Get used to the shapes. 2. Notice where the roots are. These are all moveable chords so they become whatever chord you want them to be depending on where you move them. 3. Practice with a simple chord chart. Can you move these around to become other chords? It helps to get to know the notes on the neck, but well talk about that soon if you're unfamiliar with that. So, dig in to these. Start becoming familiar with them and check out part 2 here. Practice up, let me know if you have questions and thanks again for serving your local church! *This is great stuff for any guitarist, not just electric players, though they will tend to use these more than open chords like and acoustic player would in this style.